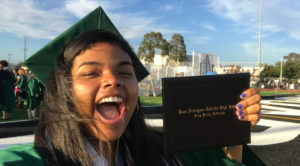 My name is Tajah Morrow and I am a graduate from Cabrillo High School and am now a current CFJ alumni and Board Member attending Cal State Long Beach. It’s unbelievable how time goes by so fast because I feel like it was just yesterday I was attending my first CFJ workshop during my freshman year of high school. ‘CFJ alumni’ sounds so strange to me, in my years with CFJ I’ve been put into almost every youth leadership position there is, I am one of the many walking examples on how Californians for Justice really helps turn students into strong leaders. As an example, when I reflect back on how race has impacted my educational experience, I remember not seeing teachers and staff that look like me represented in my classroom and in our school. Because of the lack of communication and transparency, I was not informed about AP classes and how important it would be to take them in the long run for college. When I joined Californians for Justice, I realized that I was not the only young person and student who felt like this, but there were other students of color who were not aware of the benefits of taking AP classes and how that would help them in their future. Californians for Justice has tremendously impacted my life by opening my eyes and exposing me to different types of issues like school budgeting or even gender and sexuality studies which transformed me into the social, racial, and educational justice warrior that I am today! We need Californians for Justice because for some of the young people in Long Beach, it’s our home away from home, it’s OUR safe haven, it’s OUR space. CFJ is not called ‘youth lead’ for no reason, students are out here finding their voice that they thought they never had. Students are speaking up for themselves and their community. Californians for Justice was that safe space for me that has guided me in the direction of greatness and now here I am as an alumni and ready to continue to make powerful systemic change.